Christmas is a hectic time -- especially when you are the one cooking the meals. To cut down on some of the stress, start planning a Christmas buffet menu ahead of time. Start your Christmas celebrations off right with this breakfast buffet that can't be beat. Breakfast hashbrown casserole - Simple enough to make in a matter of minutes, this hashbrown casserole is still tasty enough for a Christmas celebration. Scrambled eggs with lettuce and bacon - Dress up plain scrambled eggs with a generous dose of lettuce and bacon. Raspberry baked stuffed French toast - Take ordinary French toast from drab to fab with a dollop of cream cheese and raspberry jam. Sweet potato muffins - Fresh from the oven and topped with melted butter, these muffins will disappear in a matter of seconds. Cinnamon rolls - Nothing beats the smell of cinnamon rolls in the morning! Cereal with fruit - For the light eater in the family, have cereal with fruit available. In addition to dates, consider cutting in other dried fruits like cranberries, raisins, or apricots. Non-alcoholic eggnog - This homemade eggnog recipe will soon become a favorite with family member of all ages. Often eaten during mid-morning hours, brunch features the perfect combination of breakfast and lunch foods. Use a few of the breakfast ideas above and add some lunchtime selections to round the buffet out. Broccoli quiche - Traditionally found on brunch menus, this broccoli quiche is sure to please even the fussiest eater. Lobster soufflé - The light, fluffy texture of this lobster soufflé makes it special enough to include on a Christmas brunch menu. Ambrosia salad - Ambrosia salad is a classic southern dish that can be modified with a variety of fruits, depending on what is available in your region. Pear and chocolate trifle - Trifles, which are often served at Christmas, feature layers of sponge cake and fruit -- in this case, freshly poached pears. 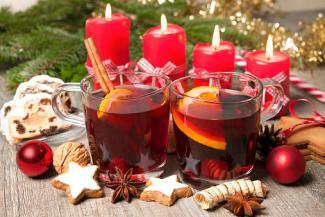 Non-alcoholic wassail - Often served warm, wassail is a must on Christmas day! Add wine or vodka to give this non-alcoholic wassail a punch. This elegant Christmas dinner buffet will be one for the memory books! 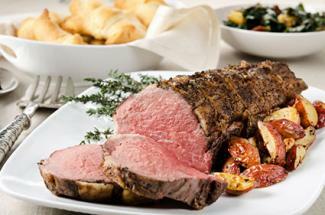 Beef tenderloin roast - Beef tenderloin is a top cut of beef, making it a must for any Christmas buffet! Coq au vin - A classic French stew that will warm guests up on even the coldest winter day. Herb roasted potatoes - For a special side dish, roast red skinned potatoes with dried or fresh herbs and spices. Sweet potato-kale salad - Sweet potatoes can be easily found during the Christmas season and when paired with fresh kale, they make a tasty, one-of-a-kind salad. Yule log - This sponge cake is sliced into a thin layer, coated with chocolate frosting, and rolled into a small log. 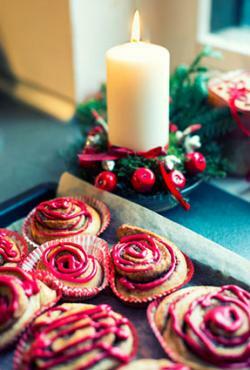 Top with dried fruit or whipped cream for a classic Christmas dessert that is as beautiful as it is delicious. Almond macaroons - Almond macaroons make a great grab-and-go dessert. Be sure to have plenty of milk on hand for dunking! Hot toddies - Serve with a scoop of ice cream to make this traditional wintertime cocktail more festive. Christmas meals often provide memories that will last a lifetime. No matter if you are getting together with family and friends for breakfast, brunch, or dinner, you can create a buffet that will be the best gift of the season!